Trying to contain myself as I write this, is difficult, but lucky for you, you can read at your own pace rather than having to listen to me talk so quickly with excitement. The Ningaloo reef was given World Heritage status not just for the presence of the 260km of Ningaloo Reef, with its 200 species of coral and 500 of fish, but for the proximity and relationship between the reef and Cape Range. Our friends at Ocean Eco Adventures looked after us for our whale shark swim yesterday and the experience they offer is truly out of this world. 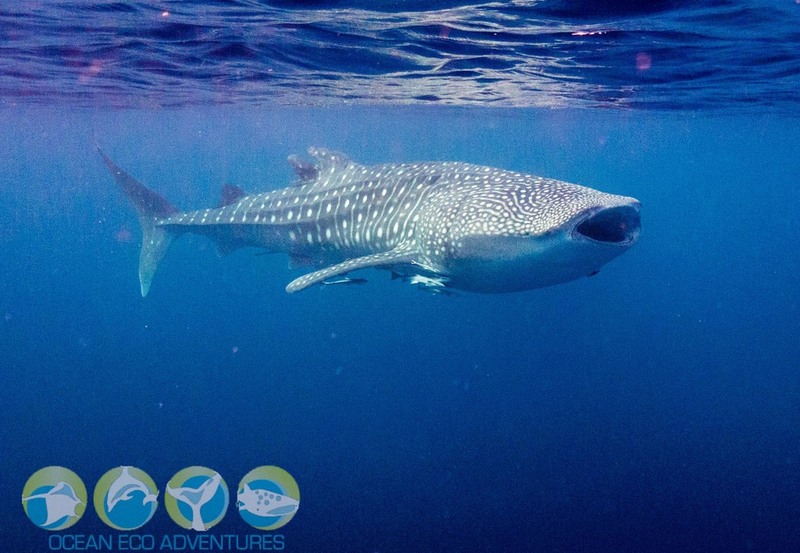 They have some of the best stats when it comes to swimming with the whale sharks, this season they have had a 100% success rate finding and swimming with whale sharks and they are the only company to have their own microlight spotter finding whale sharks for them. They have higher than industry average swim times with whale sharks, which is the whole reason we are out there. 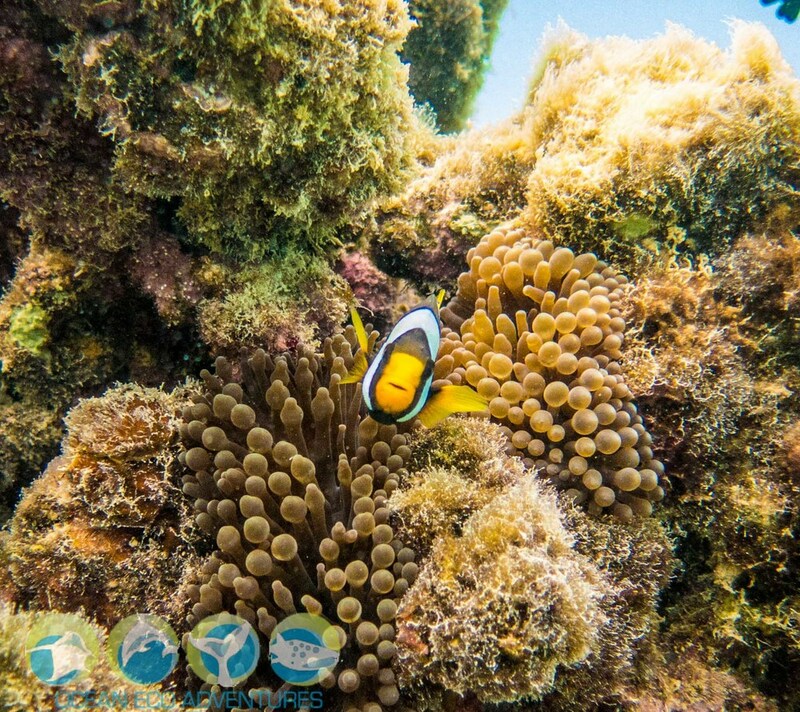 Our first snorkel was just inside the reef, this allowed us to see 'nemo', catfish and so much more life the reef has to offer. This drop also allowed us to make sure we were comfortable with our gear; all while Ocean Eco Adventures microlight was out trying to spot our first whale shark. Once out of the water we were soon heading towards our first whale shark. Both of us were slightly nervous about jumping into the big blue, I mean there are proper ‘bitey’ sharks in there too! But the tour is run in a way you don't get a chance to think of your fears, its bam, bam, and you're in the water with a whale shark before you know what's happening! This is something we really appreciated. The first amazing creature known as "fingers" to the locals was a little shy today and we only had 10 minutes in the water with him before he dived out of sight. The next 8m whale shark was an incredible experience. We jumped in 25m deep water and the sea floor was crystal clear! We were lucky enough to get almost a full hour with this shark alternating between two groups. He dived, he turned, he surfaced and he was absolutely majestic! We couldn't have asked for a better swim with these big fish. Ocean Eco Adventures were able to offer us a microlight flight with the same pilot who was spotting our whale sharks and rays through the day. It’s part of the 'Flying Fish Package' they have to offer. Mr has flown over the reef before in a helicopter so he let me jump in and take off for an experience I'll never forget, it was even better as I was able to experience it with a friend who flew in another microlight at the same time. 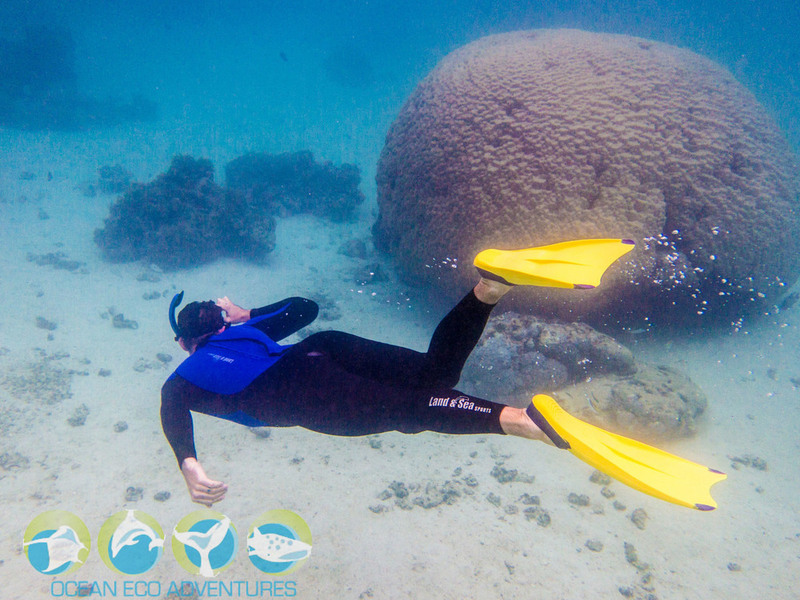 This Package has to be the ultimate Ningaloo Reef experience without a doubt. I was awe struck just swimming along the reef, but getting to see if from the sky is a whole other story. You can't really appreciate the vast and beautiful reef when you’re swimming, but from the sky it is really breathtaking. My pilot Gav said I was quiet during the flight, I was speechless (which doesn’t happen often), it is so beautiful and I was trying to take in as much as possible! We first spotted a dugong and her calf and got in low to get up close, then it was one after the other; pods of dolphins, a school of tiger sharks feeding, turtles bobbing up and down and finally before we were heading back over the range we did one more loop, and there was what I was crossing my fingers to see… a whale shark from up above. Being able to experience all of the beauty from above and below is an experience exclusive to Ocean Eco Adventures, I would not hesitate to recommend them to anyone interested in swimming with the whale sharks or if you’re able to you will not be disappointed with the ‘Flying Fish Package’, it’s worth every cent.